Ascension Dental Center – CAP Services Inc.
Ascension Dental Center is transferring to Family Health/La Clinica effective 1/1/2019. The Center in Stevens Point will continue as is – with all the staff staying on as La Clinica employees. For more information, please visit http://www.famhealth.com. Established in 2002, Ascension Dental Center (formerly Ministry Dental Center) grew from a partnership of Saint Michael’s Hospital, Delta Dental of Wisconsin and CAP Services. The vision for the center is to offer a “dental home,” where patients continue to seek both treatment and preventive care to maintain and improve their oral health. 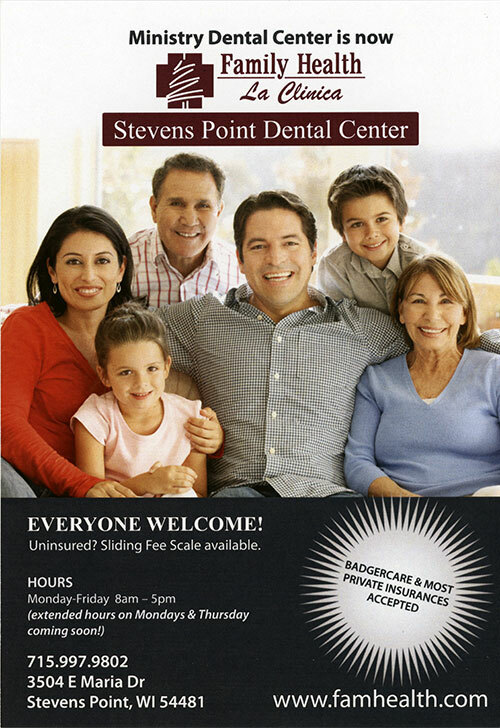 Ascension Dental serves persons enrolled in Medicaid or BadgerCare who live in Portage and Waupaca counties. In 2019, the Dental Center transferred to Family Health/La Clinica. Or visit the Ascension Dental Center website.